Although it seems early, I need to start thinking about my final research essay for one of my modules, ‘the United States in the World’ as my professor wants us to have written an initial outline by next week. 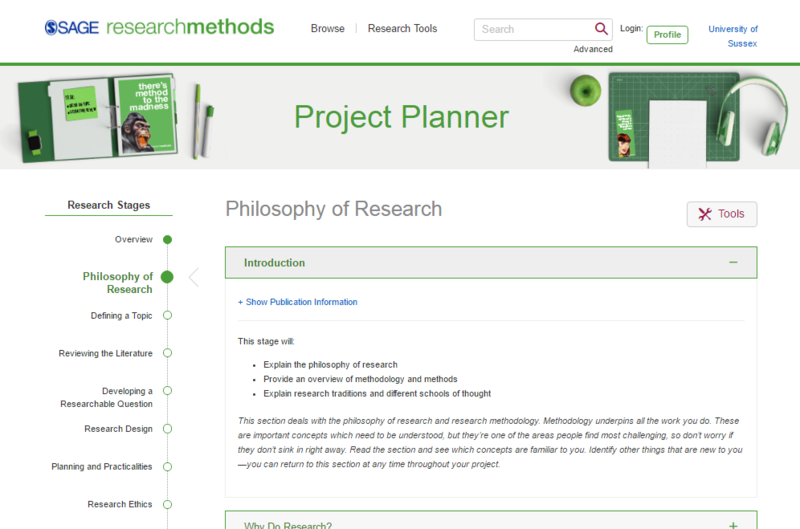 Over the past week, I have been formulating my initial ideas and used SAGE Project Planner for the first time to help shape my essay structure and research methods. When I logged onto Project Planner, my immediate feeling was one of dread as I realised I there was a lot of information to read but when I clicked on each section the sense of dread was replaced with one of satisfaction as I realised each subheading followed logically categorised advice and talked me through each ‘Research Stage’. The specification for my research essay is to take a material object that has been produced by the United States and research into how it relates to the United States’ foreign policy. The object can be anything from a film or a campaign poster to a washing machine or an embassy. The aim is to develop deep research into the political relevance in everyday objects and to excavate any cultural or political leverage these objects have in International Relations. The fact that this is quite an abstract approach, and in a style I have not before encountered throughout my degree, made me particularly grateful that I had the Project Planner that could keep me in line with very logically thought-out structural foundations. 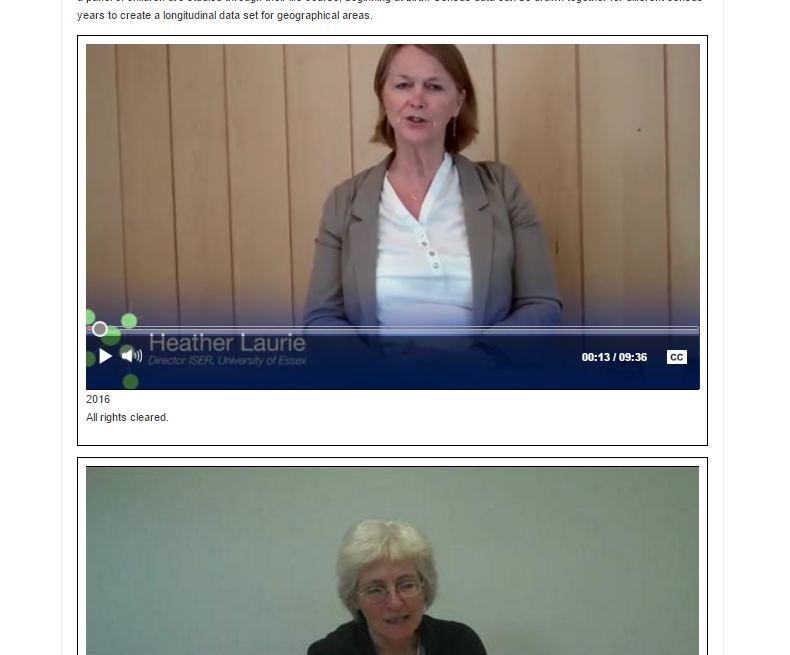 There were several videos throughout Project Planner of professors from universities giving their advice and knowledge on research methods. This was a good way to break up the text but I am uncertain to what extent I found the majority of the videos useful because, unlike text, I couldn’t skim read for relevant bits and some of the videos were quite long. Much of the advice was quite broad and the sound quality wasn’t perfect which made it quite difficult to stay focused. One of the videos I did like was the video covering ‘narrative analysis’ where the professor’s advice was opinionated which made it more gripping than others. Overall, I do like the concept of having videos but if they aren’t snappy or specific to my type of research I am unlikely to feel engaged. However, if I was pretty sure of the research methods I was going to use and just need to revise them, videos would probably be an engaging tool. I really liked the interactive checklist each section provided and found it useful to see in writing the obvious questions I don’t usually bother writing down but are easy to forget. As I went through each step, I took notes but found that without having done the readings and research, my advancement towards solidifying my question and essay’s structure was restricted. 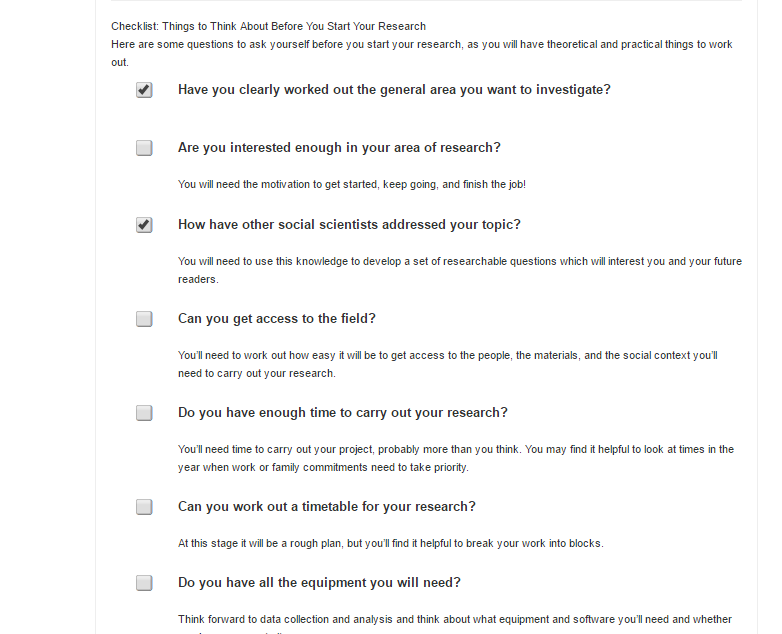 I would recommend this tool to peers, particularly those who are doing PhD length research papers as I think the amount of time spent unpacking each of these stages of research would be a very worthwhile investment.